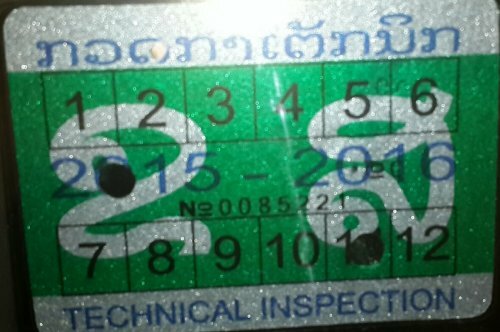 An inspection sticker is placed on the vehicle’s windshield when it passes inspection and it displays the month’s number and the year of the next inspection date. The inspection fees are Kip 50’000 for motorbikes, Kip 100’000 for cars and Kip 150’000 for trucks. For our friends in Luang Prabang, there the Technical Inspection is offered at the office “Service Provincial des Traveaux Publics et des Transports de Luang Prabang”, which is located at Ban That Luang. At Pakse, the vehicle inspection center is located at Ban Phumuong (at Km 4, Road 13S), near Vat Haysouk.